Over recent years, we have witnessed a great improvement in population-based screening methods for fetal abnormalities as a result of technological developments in ultrasound, biochemical screening and molecular genetics. However, the methods for screening the low risk population for other complications of pregnancy such as fetal growth restriction, preeclampsia and stillbirth have remained largely unchanged for the past 20-30 years. The National Institute for Clinical Excellence (NICE) has highlighted a number of research priorities in their guidelines for pregnancy care, which focus on the ability to screen apparently healthy low risk women and identify those at high risk of complications. This area has been a major focus for research in the Department of Obstetrics and Gynaecology for many years. In 2007, Cambridge received funding from NIHR to establish a comprehensive Biomedical Research Centre (BRC). The Cambridge BRC Women’s Health theme focuses on tackling the origins, treatment and prevention of many of the health issues that affect women during their reproductive years. 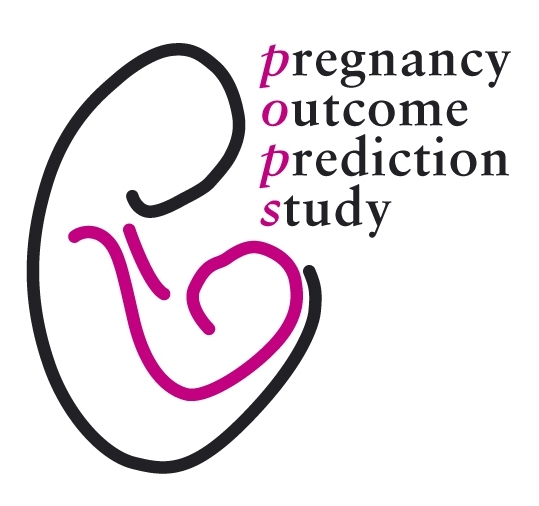 The bulk of the Cambridge BRC funding for Women’s Health supports a prospective cohort study called the Pregnancy Outcome Prediction study (POPs) (Pasupathy et al 2008, Gaccioli et al 2016). 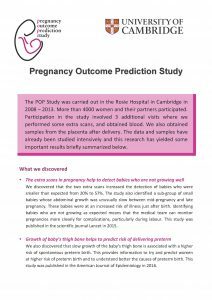 The POPs study included 4,512 nulliparous women with a viable singleton pregnancy attending The Rosie Hospital (Cambridge, UK) for their dating ultrasound scan between 2008 and 2012 (Pasupathy et al 2008, Gaccioli et al 2016). Women were serially scanned through the pregnancy and had blood obtained at recruitment, 20, 28 and 36 weeks gestational age. DNA samples and height/weight measurements of the partners were also collected. After delivery, biopsies of the placenta, placental membranes, umbilical cord, and cord blood were collected (visual placental sampling demonstration). Thorough design of POPs and careful sample collection allowed us to create an extensive, optimally phenotyped biobank of complicated pregnancies and controls, including approximately 230,000 blood and tissue samples stored in -80°C freezers, 24,000 formalin fixed placental biopsies, and 4,000 paternal DNA samples. The rationale behind our focus on the placenta is that placental dysfunction is implicated in several major complications of pregnancy associated with adverse maternal and infant outcome, such as preeclampsia, fetal growth restriction and stillbirth. Yet, despite years of intensive research, screening for these complications is still largely based upon clinical grounds rather than ultrasonic and/or biochemical assessment of placental function. Therefore the projects based on POPs samples have the following aims: (i) understanding the mechanisms leading to placentally-related complications, (ii) studying the association between pregnancy complications and the presence of infectious agents in the placenta, (iii) evaluating the performance of known biomarkers and serial ultrasonography in assessing maternal and fetal well-being, and iv) discovering novel, placentally-derived circulating biomarkers which reflect the underlying pathology and are highly sensitive and specific in predicting the associated disease. Next Generation Sequencing (NGS) applied on placental biopsies, with a focus both on the transcriptome and the epigenome (small RNAs, DNA methylation and histone modifications). These projects received funding from the Medical Research Council, the NIHR, the Wellcome Trust, the British Heart Foundation, and the Stillbirth and Neonatal Death Society (Sands). We have also benefited from industry, with GE Healthcare providing two ultrasound systems and Roche providing equipment and reagents for ~80,000 assays of placental proteins. Some of these studies involve collaborations with the Cambridge University School of Biological Sciences (in particular, the Centre for Trophoblast Research with whom we have extremely close links) as well as the CRUK Cambridge Institute and the Wellcome Trust Sanger Institute. These associations reflect one of the key approaches in our research, namely, to use the incredible technical innovations that have been achieved in sequencing to study our placental samples. 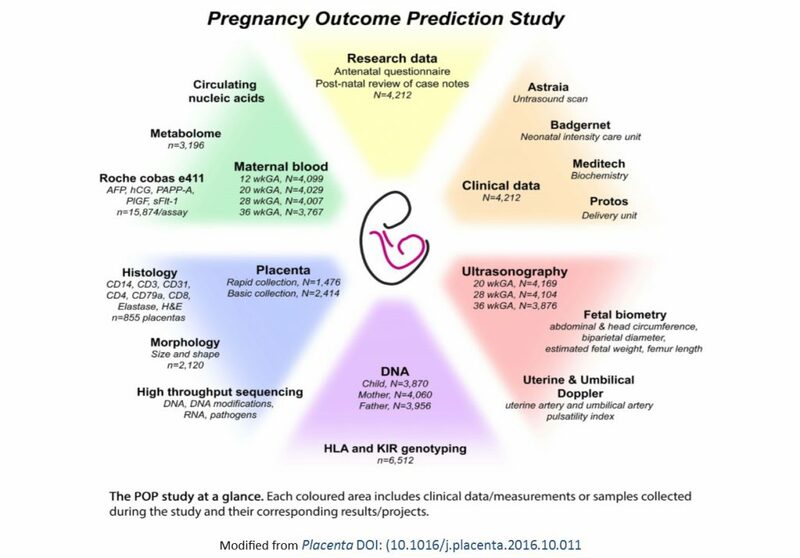 The pregnancy outcome prediction (POP) study: Investigating the relationship between serial prenatal ultrasonography, biomarkers, placental phenotype and adverse pregnancy outcomes. Gaccioli F, Lager S, Sovio U, Charnock-Jones DS, Smith GCS. Placenta 2017;59(Suppl 1):S17-S25. Prediction of Preeclampsia Using the Soluble Fms-Like Tyrosine Kinase 1:Placental Growth Factor Ratio. A Prospective Cohort Study of Unselected Nulliparous Women. Sovio U, Gaccioli F, Cook E, Hund M, Charnock-Jones DS, Smith GCS. Hypertension 2017;69:731-738. DOI: 10.1161/HYPERTENSIONAHA.116.08620. Fetus-derived DLK1 is required for maternal metabolic adaptations to pregnancy and is associated with fetal growth restriction. Cleaton MA, Dent CL, Howard M, Corish JA, Gutteridge I, Sovio U, Gaccioli F, Takahashi N, Bauer SR, Charnock-Jones DS, Powell TL, Smith GC, Ferguson-Smith AC, Charalambous M. Nat Genet 2016 Dec;48(12):1473-1480. doi: 10.1038/ng.3699. Fetal Growth and the Risk of Spontaneous Preterm Birth in a Prospective Cohort Study of Nulliparous Women. Partap U, Sovio U, Smith GC. Am J Epidemiol. 2016 Jul 15;184(2):110-119. doi: 10.1093/aje/kwv345. Accelerated Fetal Growth Prior to Diagnosis of Gestational Diabetes Mellitus: A Prospective Cohort Study of Nulliparous Women. Sovio U, Murphy HR, Smith GC. Diabetes Care 2016 Jun;39(6):982-987. doi: 10.2337/dc16-0160. The relationship between human placental morphometry and ultrasonic measurements of utero-placental blood flow and fetal growth. Salavati N, Sovio U, Mayo RP, Charnock-Jones DS, Smith GC. Placenta 2016 Feb;38:41-48. doi: 10.1016/j.placenta.2015.12.003. Screening for fetal growth restriction with universal third trimester ultrasonography in nulliparous women in the Pregnancy Outcome Prediction (POP) study: a prospective cohort study. Sovio U, White IR, Dacey A, Pasupathy D, Smith GC. Lancet 2015 Nov 21;386(10008):2089-2097. doi: 10.1016/S0140-6736(15)00131-2. Study protocol. A prospective cohort study of unselected primiparous women: the pregnancy outcome prediction study. Pasupathy D, Dacey A, Cook E, Charnock-Jones DS, White IR, Smith GC. BMC Pregnancy Childbirth 2008, 8:51. All the ‘techy’ talk going over your head? See the POPs newsletter for a layman’s summary (click on image).